Nestlé Waters North America unveiled five medium-duty beverage trucks equipped with ROUSH CleanTech propane autogas fuel systems: Photo via Roush. 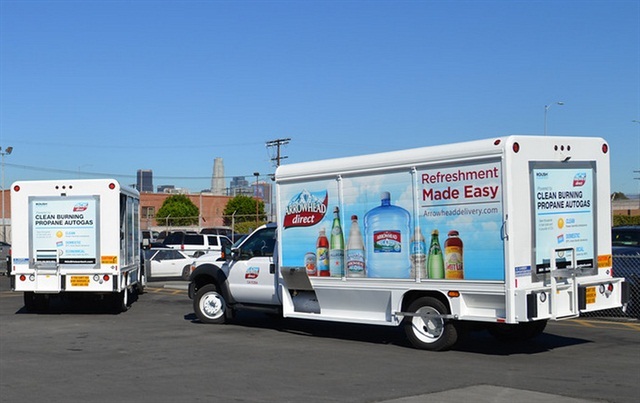 Nestle Waters North America has deployed five propane autogas powered delivery trucks in Los Angeles to deliver Arrowhead Mountain Spring Water. The company purchased the propane powered trucks because the system maintains a full factory warranty and the infrastructure costs were low. Nestle Waters currently operates more than 2,000 trucks in the U.S. that primarily run on diesel. “Like many, we are evaluating the different technologies that offer savings over the life of the vehicle and realized that propane autogas is a smart choice for reducing fuel and maintenance costs while providing cleaner air for the community,” said Bill Ardis, fleet manager of Nestle Waters North America. In Los Angeles, Nestle Waters uses on-site refueling for its propane autogas trucks, which the company says is cheaper than the infrastructure needed for diesel servicing. Autogas can cost up to 50% less than diesel, according to ROUSH CleanTech. Nestle Waters purchased the trucks from Midway Ford. Each vehicle is equipped with a California Air Resources Board and EPA compliant ROUSH CleanTech propane autogas fuel system. “Fueling beverage delivery trucks with propane autogas offers the best total cost of ownership without compromising standard delivery procedures,” said Todd Mouw, vice president of sales and marketing for ROUSH CleanTech. “By choosing this fuel, fleets around the nation are reducing their operating costs and lowering their carbon footprint.